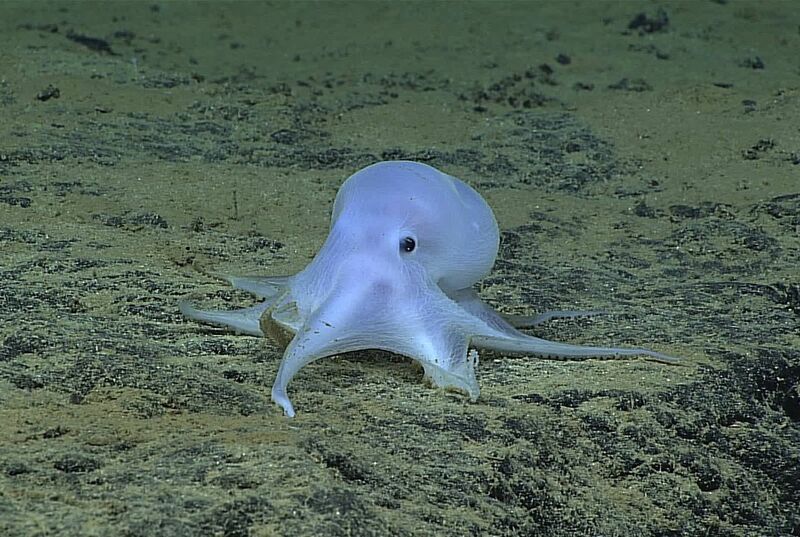 Scientists say they have discovered what might be a new species of octopus while searching the Pacific Ocean floor near the Hawaiian Islands. 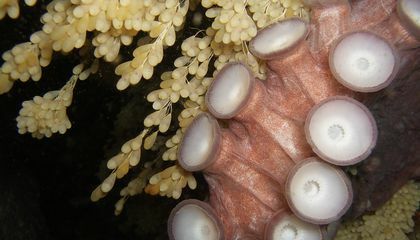 On Feb. 27, a team found a small light-colored octopus at a depth of about 2.5 miles. It was in the ocean near Necker Island, said Michael Vecchione of the National Oceanic and Atmospheric Administration (NOAA). The octopus did not have fins. All of its suckers were in one row on each arm, Vecchione said. The octopus "did not seem very muscular" and was light colored, he said. "This resulted in a ghostlike appearance, leading to a comment on social media that it should be called Casper, like the friendly cartoon ghost. It is almost certainly an undescribed species, " he said in the statement. The statement was posted on the NOAA website. It's unusual to find an octopus without fins so deep in the ocean, said Vecchione. He noted that the previous depths at which an octopus without fins was found were less than 4,000 meters, or 2.5 miles. Two scientists he has consulted "agreed that this is something unusual and is a depth record," said Vecchione. He works with NOAA's National Systematics Laboratory. The octopus was discovered during a search of the ocean floor by a remotely operated vehicle from NOAA's Okeanos Explorer, he said. Why does rain have such a distinctive smell? Why was this octopus not discovered before? maybe? the scientists never went that far in the ocean before and the octopus is a new species that was always hiding deep deep in the ocean. I think the Octopus wasn't discovered before because the octopus is a very light color that makes it look like a ghostlike thing because its colors are so faded. The octopus has a ghost like image which may have made hared for people to see. from a distance if they do manage to see it, they may believe that it's just like any other octopus. However, when they did get close and actually see the species they realized that it was a new species.